This has been a great week so far. Monday I got to take 8 kids/youth and 1 extra adult for a Kicks for Kids event. 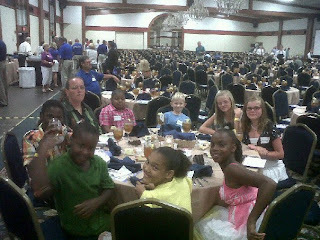 We were invited to take part in their banquet for their golf fundraiser. The kids had a great time! They had a great meal, got to meet the UK head coach, meet some Bengals cheerleaders and get one of their autographs, and so much more. Tuesday night we had "simply dinner" at the MAC. This ministry continues to grow. We had a total of 83 show up for dinner last night. Martha Pike provided a great main course for the night. Everyone had a great time. I am very excited about one of our new ministries we started this summer. "Simply Dinner" provides a free meal on Tuesday Nights in June from 6-7pm to anyone who shows up. In the past two weeks we have provided 135 dinners to 102 different people. Dinner and fellowship (and an air conditioned building) is all that is provided, but people are having a great time. Pray that as we reach out to the community through this ministry that lives might be changed not only in the here and now, but for eternity. It has been a very full week at the MAC. Monday we had "Children's Night"
Tuesday we had "Simply Dinner"
Wednesday we had "Youth Night"
Friday night we had an "Air Conditioned Picnic"
Sunday we had our first "Giving Back Project" (we passed out ice cream at Krogers and helped to clean up their parking lot). It was a busy, but fun, week. Just this week we reached over 150 individuals. Thursday - "Giving Back Project" from 6:30-7:30pm. If you are free come out and join us. I also get to speak with Highland Heights Baptist VBS on Monday and do a mission project with Burlington Baptist VBX on Wednesday. Should be a great week. Please keep me and all the volunteers in your prayers. Pray that we have opportunities to share Christ.